We are delighted to announce that CSIRO's Data61 Ribit.net are the official CeBIT Australia Student Jobs Networking Partner. For the first time, we have set up a special curated networking event for students at CEBIT Australia, on Thursday 17 May, 1.30pm - 4.00pm. Select exhibitors at CeBIT Australia have invited students to meet them at the exhibition to specifically talk about the specific jobs and career opportunities they have for students. CeBIT Australia is one of Australia’s largest technology conferences and exhibitions - more than 15,000 people will attend over 3 days and over 300 exhibitors will be present. If you have skills or experience in coding, technology, finance, business, marketing, creative design, customer liason or administration, this event could open up incredible new opportunities for you. You’ll have an opportunity to talk to big technology brand names and emerging, exciting small businesses and start-ups in a safe, supportive environment without having to go in cold and do the hard personal sell! Exhibitors get to meet the future talent pipeline that will help their companies grow and innovate and you will get a warm personal reception from some of Australia's leading technology employers. Department of Industry - approx. 10 startups are on this stand to talk to! Jobs4NSW (aka Entrepreneur HQ) - approx. 16 startups are on this stand to talk to! 2:00PM - 4:00PM - Networking session commences. Start making your way around the exhibition. Look for a green Ribit balloon. This balloon indicates that the exhibitor is open to talking about job and career opportunities with you! Free, however, registration is required. Instructions are on the right. 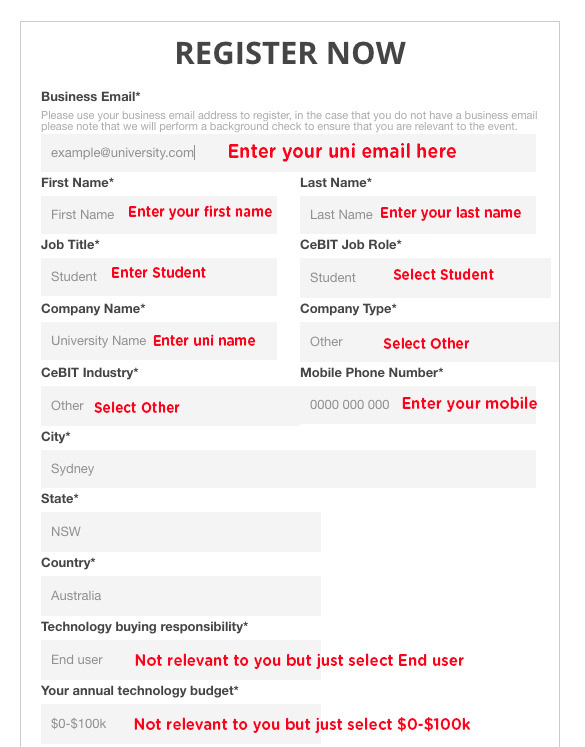 You must register on the CeBIT Australia website. The registration process is designed for businesses so here are a few snapshots below to keep you on track. 1. 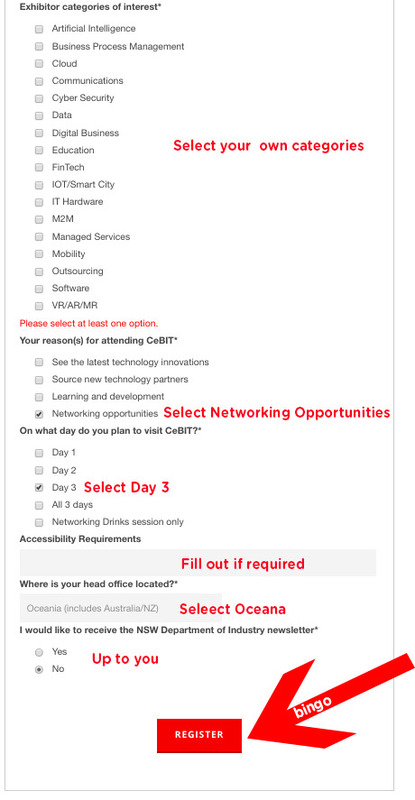 Click here to visit the CeBIT Australia website registration page. 2. 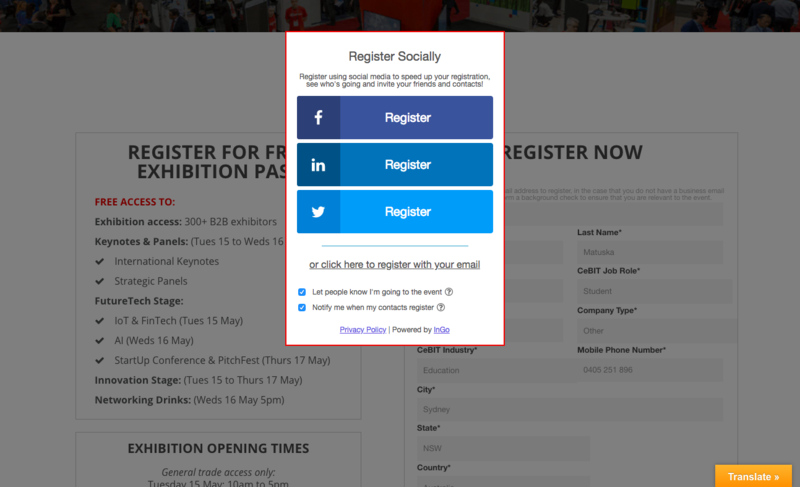 Register through social or with your email address.